During primary infection, before the development of the immune response, there is lympho-haematogenous dissemination of TB bacilli, most importantly to the apical-posterior areas of the lung*. (There are different theories as to the reason for this apical localisation.) At this site the disease may progress either without interruption or after a latent period of months or years - this results in pulmonary tuberculosis of the adult type (reactivation-type tuberculosis). Characteristically post primary pulmonary tuberculosis in adults is initially apical and it is usually asymmetrical. Liquifaction of a caseated area leaves a cavity that does not collapse due to the fibrous capsule. The bacilli reach extremely high concentrations in a cavity and drainage into the bronchial tree ("endobronchial dissemination") advances the disease into surrounding lung, with further cavitation. 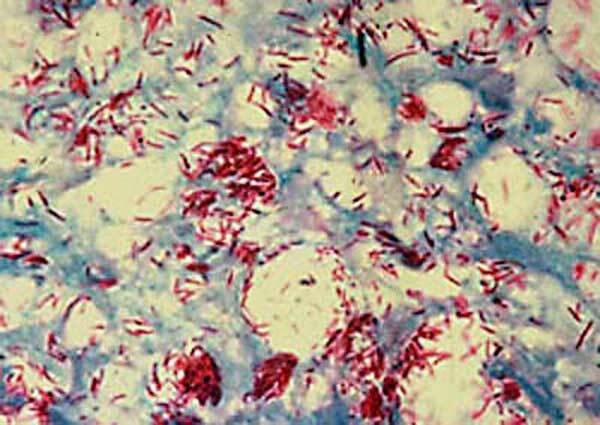 Coughing spreads bacilli to others. *Except in bats, where it is located at the base of the lower lobe (they spend much of their life hanging upside down). This patient was a 21 year old man who gave a history of cough with mucopurulent sputum and hoarseness of the voice for three months (due to tuberculous laryngitis) but no haemoptysis, night sweats or wasting. On examination he had clubbing of the fingers and signs in both lungs. Acid-fast bacilli were seen in his sputum. The mycobacteria appear bright red following Ziehl-Neelsen staining. 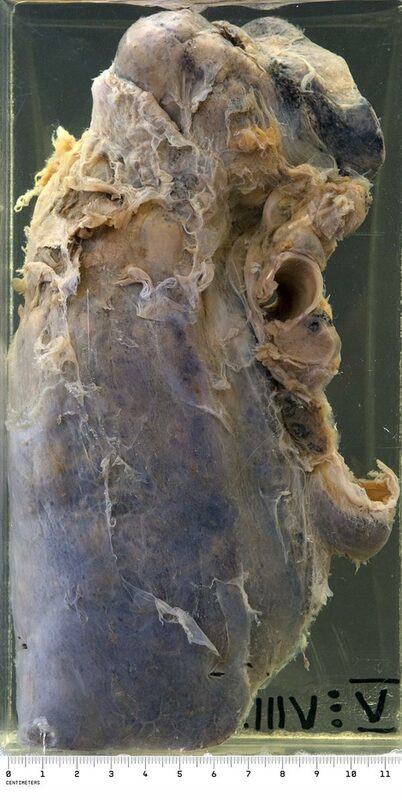 This is the left lung. In the upper lobe there is a large tuberculous cavity with a ragged lining. A small, more recent cavity is present in the upper part of the lower lobe. Both lobes exhibit a tuberculous bronchopneumonia which is becoming almost confluent in some areas, (and thus "lobar" in distribution). Scattered small tuberculous foci (likely representing lymphatic spread) are also present. When the bottle is reversed, old, dense fibrous adhesions are seen on the surface of the lung.